The Immigration Amendment Bill was passed by South Africa's National Assembly in March, despite arguments from opposition parties and civil society groups that it could lead to genuine asylum seekers being rendered illegal and facing up to four years in jail. Asylum seekers currently have 14 days after entering the country to go to a refugee reception centre and make a formal application for asylum. The amended bill, which only needs approval by the National Council of Provinces to become law, reduces this period to five days. 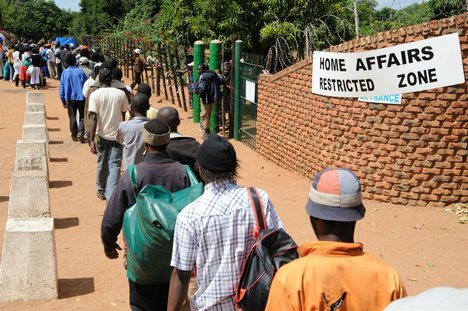 Roni Amit, a senior researcher at the African Centre for Migration and Society at Witwatersrand University in Johannesburg, pointed out that even 14 days was often not enough time for people to reach a refugee centre, of which there only seven in the country. "A lot of times, crossing the border can be very traumatic - people are often attacked or detained; it takes them a while to figure out what they need to do and where they need to go. They might also not have money for transport," she told IRIN. Jacob van Garderen, National Director of Lawyers for Human Rights, noted that "sometimes it takes [asylum seekers] days to get through queues just to reach the front door of [a refugee centre]." An additional amendment will require officials at border posts to make an initial assessment of whether an individual is eligible to apply for asylum. Amit said it was unclear what this pre-screening process would consist of, but it was "very problematic that it would be done by immigration officials with no training in asylum law." The UN Refugee Agency (UNHCR) also raised concerns about the new legislation, but spokesperson Tina Ghelli said they had taken note of assurances given by Home Affairs Minister Dr Nkosazana Dlamini Zuma when addressing Parliament that the pre-screening process would consist only of a criminal background check, and that no one would be penalized for failing to apply for asylum within five days if the delay was the fault of the Home Affairs Department. South Africa gets the largest number of asylum applications in the world, with over 200,000 received in 2009 alone, according to UNHCR. A backlog of applications, estimated at 400,000 by Braam Hanekom of People Against Suffering, Oppression and Poverty (PASSOP), a Cape Town-based NGO, means that individuals often wait up to four years for a decision on their refugee status.